Professor Thurman, I would first like to ask you about your involvement with India, Tibet and the Dalai Lama. How did it start? I first came to India in 1962, when I was 21. I reached in November after staying in Turkey for eight months. I was looking for some spiritual teaching (from Sufi masters). Then, I thought yoga would be 'the thing'. Here in Delhi, I met some swamis; I liked them, but when I later met Tibetans lamas, something woke up in me, it was like my spiritual vasana (present consciousness of past life perceptions). I had discovered the Buddha Dharma in its original form. There were very few books on Buddhism at that time? But I met the lamas themselves. I was so excited. I got a job in the lama's school in Dalhousie (Himachal Pradesh). I started to study the Tibetan language and Buddhism, while teaching English to the young lamas. It is there that I met an old Mongolian lama called Geshe Wangyal. He had lived in Tibet for 35 years and escaped early after the Chinese invaded Tibet in the 1950s (he eventually migrated to the US). It is with him that I started serious studies. I had karma with him. You know how it then worked in Asia: You met someone, and this person gave you a message to carry for one of his friends somewhere else. It is how I met him. The minute I saw Wangyal, I could not move, I was stuck on the spot. It was karmic. I learned the Tibetan language in 10 weeks with him. I studied with him for about a year-and-a- half. I saw him from a distance in 1962, but in 1964, I was introduced by Wangyal. I wanted to become a monk, but Wangyal kept refusing; I wanted to devote my life to (Buddhist) studies. Wangyal told me: "You are sincere, you are already living like a monk, but in the long term, it is not your karma, don't formally become (a monk)." I was not ready to listen to him, I wanted to shave my head and go for it. Wangyal told the Dalai Lama: "This boy is a good boy, he is serious, but although he is serious, don't make him a monk. In the American life, he won't be able to keep his vows." His Holiness made me wait about a year and I was eventually the first foreigner to be ordained a Tibetan Buddhist monk in 1965. It is so easy to be a monk, you have so much social support, it is like getting a life-long McCarthy Fellowship; you are supported by the community; it is wonderful. After the Dalai Lama had given in, I remained a monk for one-and-a-half year only. I had been sent back to the West (to Argentina with a lama as Spanish translator), but it was difficult, there was nobody to speak too, not even the Hare Krishna people at that time; everybody thought that I was mad. There was no support for a monk. So after sometime, I re-entered the university, became a lay person, then I fell in love and married, and so on Geshe Wangyal was right. Now, I have to say that I am the first ex-monk. The title of your book is Why the Dalai Lama Matters. Could you tell me why the Dalai Lama matters, in the United States, in India, but also in China? The Dalai Lama matters on the world plane. I call him the world leader although he does not have a country today and has no (political) recognition. He is an ethical and spiritual leader, but also a social and political leader; because he brings ethics and spirituality into politics. It is where it should be. Politics should be about truth and ethics. Politicians should serve people's ideals. The Dalai Lama brings this (into politics). All leaders who have met him agree with this, except for the leaders of China who say that he is not a nice fellow; although, they perhaps know, but can't say it. 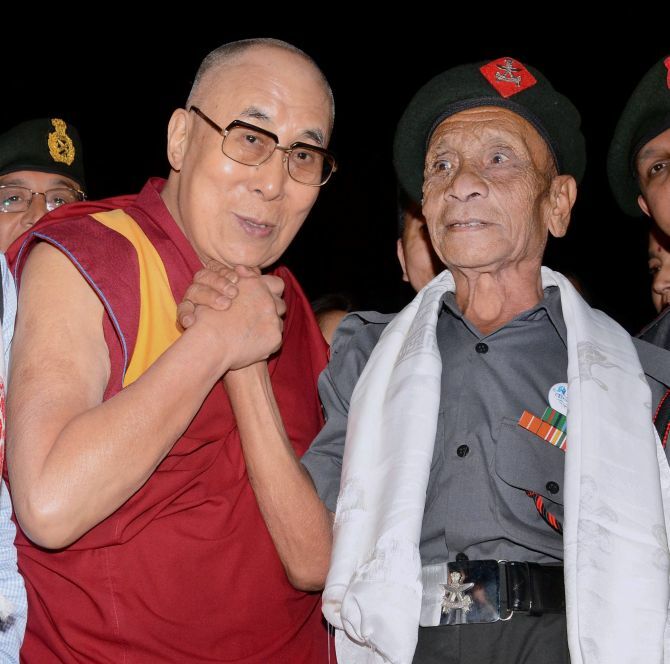 The Dalai Lama met the first two generations of Chinese political leaders (Mao Zedong, Deng Xiaoping etc)? But he has never met the current leadership. It is amazing that the leadership of China has not met him for more than 50 years; those who met him are dead today. To answer your question, one thing what we need today on the planet is to reduce the greed of consumer capitalism and the hatred of universal militarism. These are the two banes of the planet. Consumerism destroys the environment, so is materialism, either capitalist or Communist materialism. Militarism uses up enormous resources, even poor countries have huge military budgets; today even rebels can undertake terrorist actions; militarism is a great danger for humanity. The Dalai Lama teaches contentment against consumer greed, environment protection against capitalist or Communist greed; he teaches ahimsa in the Gandhian tradition. Being against militarism, he points the way towards demilitarisation. I wrote the book because many people who like the Dalai Lama believe that he is politically naive; they reject his middle way plan and his insistence on non-violence resistance against genocide and he promotes dialogue, even in front of tyrants because he sees them as human beings. People think that it foolish, I think that it is intelligent. Do you see any hope in the Tibetan issue? Absolutely, I am very hopeful. But young Tibetans believe that it has led nowhere. Some may say this and the press magnifies it. Today's world ideology believes that only militarism is powerful, and everything, which deviates from it, should be assaulted. They had a conference in Dharamsala in November 2008 and the middle way approach was reaffirmed. Some (youth) just expressed impatience with the fake level of the dialogue; they said: "What is the point to negotiate, if the (Chinese leadership) denounces the Dalai Lama at the same time?" They wanted a stronger stand in the dialogue and I agree with them. (But the movement) will never turn violent during the life-time of the Dalai Lama, because the (Tibetan youth) love the Dalai Lama. They may grumble; Tibetans are very individualistic. It is said that when you have 20 Tibetans in a room, you have 40 different horns (like the yaks), they have an individualistic mentality. It is good.